Many small to medium woodworking shops still hesitate before investing in wood design software to speed up their workflow. There can be a perception that wood software is something relevant to only big companies that focus on building large quantities of standard units. And at the same time it can be considered less well adapted to a small business making a variety of made to measure units using traditional methods. I don’t have time to learn the software right now. I will wait until things slow down. I don’t really understand how it works and feel intimidated by the technology. Good woodworking design software is too expensive. I don’t understand how to choose the right software for my company. I am not sure what real life advantages I will get from my investment. Why change one’s habits when they are working? But the fact is that we live in a fast changing world where the economy dictates the survival of the fittest. In a fast changing world survival requires that one change with it. Here is a good example of a smaller sized woodworking business that uses our woodwork design software Polyboard to cut production time in half. Mark Nichols, of Mark Nicols & Co Ltd, who is a member of our Wood Designer Community, has kindly allowed us to explain the way he uses Polyboard in his business. In the following example Mark explains how his business has integrated Polyboard with various other software solutions to produce a fast and efficient workflow. The bread-and-butter work for Mark and his colleagues is built-in cabinetry, either made in painted or veneered MDF. Mark’s shop will make 8 to 9 designs per week, ranging from single door cabinets to whole libraries. Mark’s team uses Polyboard to design and build all his projects. I know people mention that the margins in this business are tight. I don’t find that really, but time is always of the essence and I’ve tried all manner of design software but Polyboard does suit our business as we don’t really need to show high quality visuals (my East End chat will charm most customers), but the manufacturing is the key to speeding the work process up and I would imagine that a 60% profit on a job is easily achievable. He takes precise on-site measurements to include all the necessary details. He complements measurements with as many photos as possible to eliminate any ambiguities during the design phase. Then he uses Polyboard to precisely design the cabinetry. He used to just rough sketch the job, giving it an approximate price and if the job was accepted, would try to finalise the plans. Now he finds it’s just as quick to draw the precise plans in Polyboard. When the job is accepted, it goes straight to the workshop without any need to complete the design. The cutting lists can be exported straight away to a cutting optimization program to give the exact materials, cutting plans and labour charges for the job. Click here for information on our optimization software, OptiCut. Then Mark uses FreshBooks, a cloud based quoting and invoicing program aimed at the freelance design market. He finds it a great fit for manufacturing businesses as it allows hime to give each client a ‘portal’ like Amazon and keeps all jobs under a clients account. He can monitor their questions and it has a basic ‘ticketing’ system to allow the client to direct questions to either the office or the workshop. Once a job is accepted, it is passed directly to the workshop with all the manufacturing drawings and cutting lists. The workshop is equipped with a laptop running Polyboard to check any dimensions on screen. Both workshop and the office user a Dropbox account to be able to share visuals, cutting lists, drawings and customer quotes so that everybody knows where everybody else is going. They don’t run CNC. All the work is small-scale but with an extremely fast turnaround, so they normally use a panel saw, and traditional machinery, including a lot of Festool gear that enables them to work very fast on the smaller production jobs. This is a really good example of how a smaller woodworking business can use modern software solutions to create an efficient workflow that as Mark says, can reduce design and production time by 50% to 60%. Here’s an example of a project that Mark has recently built. The project is a utility room where Mark had to design cabinets to fit around and hide a boiler as well as build in a mini kitchen with a small sink and oak worktop. I found the design using Polyboard easy, as usual, and it allowed me to ‘unbox’ units to allow the customer (more likely the plumber) access to certain parts at any time. The workshop manufacture took one craftsman one day to make from the plans, cutlists etc. This included the doors as we have a spindle moulder set up with a 6mm grooving cutter just for shaker style doors. The install took another day with two men. Could be quicker but as there was a solid oak worktop and sink to install, this time was added. If you would like to try Polyboard for free to see if it would be suited to your business, please click here to go to our home page. Then register as a Free member and you’ll be able to download and test out the software, plus access lots of training resources and other benefits. If you like what you see, sign up as a Full member to buy the software at a 10% discount, or continue to use it without buying in conjunction with ongoing Full membership. thanks ness…in all your improvements with your software have you come up with a better system for face frame for us Americans? I’ve had look at your web site and really enjoyed your work, which seems to be more traditional frame and panel cabinets. I have done mostly this sort of work myself and never really loved working with industrial manufactured boards. We still haven’t yet got round to making a really easy to use face frame method. While waiting I have devised a method that does work by making the carcases from assembled panels. 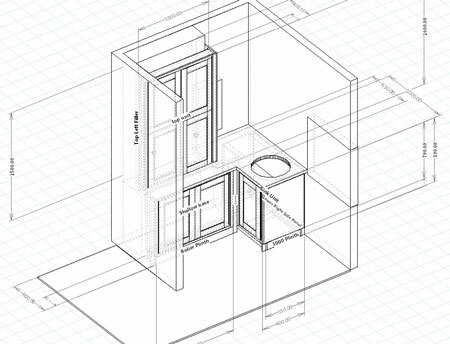 The good thing about this method is that once the system is set up the cabinets remain parametric. If you post a thread on the forum you could request a video to show how I set this up. Ness has done a new video linked to from there which shows a good new way to do those face frames. Let us know what you think.